Tethys Platform provides an easy way to create new app projects called a scaffold. The scaffold generates a Tethys app project with the minimum files and the folder structure that is required (see App Project Structure). You will need to use the command line/terminal to manage your app and run the development server. See the Terminal Quick Guide article for some tips if you are new to command line. Windows Users: If you have admin rights on your computer, it is even better to right-click on the tethys_cmd.bat and select Run as Administrator. You will be prompted to enter metadata about your app such as, proper name, version, author, and description. All of these metadata are optional. You can accept the default value by pressing enter, repeatedly. In a file browser change into your Home directory and open the tethysdev directory. If the scaffolding worked, you should see a directory called tethysapp-dam_inventory. All of the source code for your app is located in this directory. For more information about the app project structure, see App Project Structure. Windows Users: If you get an error when running python setup.py develop, then you have insufficient permissions to install your app in development mode. Either try opening the tethys_cmd.bat as an administrator and run the commands again, or run python setup.py install. The disadvantage to this method is that each time you want Tethys to reflect changes to your app code, you will need to run python setup.py install again. Browse to http://127.0.0.1:8000/apps in a web browser. If all has gone well, you should see your app listed on the app library page. Exploring your new app won't take long, because there is only one page. Familiarize yourself with different parts of the app interface (see below). 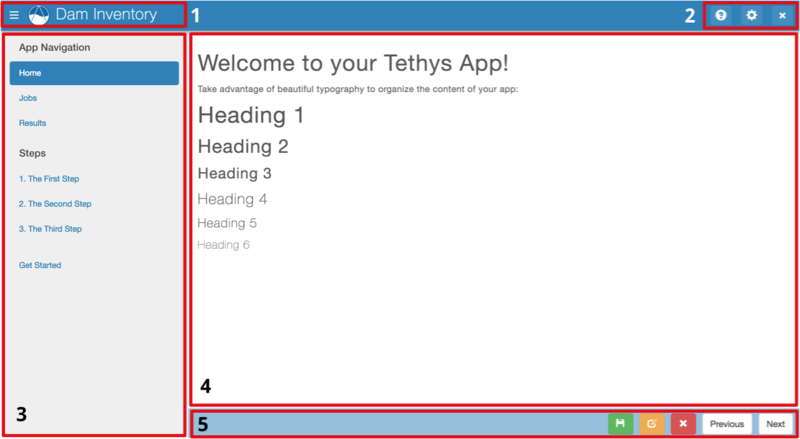 Parts of a Tethys app interface: (1) app navigation toggle and app branding; (2) exit button, settings, button, and custom buttons; (3) app navigation, (4) app content, and (5) app actions. To stop the development server press CTRL-C.
As you explore the contents of your app project, you will notice that many of the directories have files named __init__.py. Though many of these files are empty, they are important and should not be deleted. They inform Python that the containing directory is a Python package. Python packages and their contents can be imported in Python scripts. Removing the __init__.py files will result in breaking import statements and it could make some of your code inaccessible. Similarly, if you add a directory to your project that contains Python modules and you would like them to be made available to your code, add a __init__.py file to the directory to make it a package. © Copyright 2014, Nathan Swain. Revision ede95de3.